Hair loss can be a very embarrassing thing, especially if you're only in your 20's or 30's. Nothing is scarier than waking up in the morning to find a pillow or bed filled with your hair. If your hair loss is caused by genetics, then tough luck. However, if other factors are at play, then you can stop it before it gets the better of you. 1. Stay away from salt - A diet that is high in fats and salt can affect your kidneys. When your kidney's functionality is compromised, your body starts to produce acidic blood. Even if hair is considered dead skin cells, the roots still need a healthy blood supply to thrive. With acidic blood, the hair withers, weakens and falls of easily. 2. Load up on vitamins - Vitamin deficiency is another cause of hair loss. If you think you're not getting enough vitamins and minerals from your diet, you can try boosting it with some supplements. Any drugstore variety supplement will do, as long as it's complete. 3. Tone down on hair treatments - People spend thousands of dollars on hair treatments as part of their hair care routines. However, most hair treatments have chemicals in them that weaken the hair's hold on the scalp. If you must, go for hair treatments that are composed of natural ingredients. Extra virgin olive oil, mango extracts and yoghurt make good hair treatments and don't contain strong chemicals and toxins. 4. 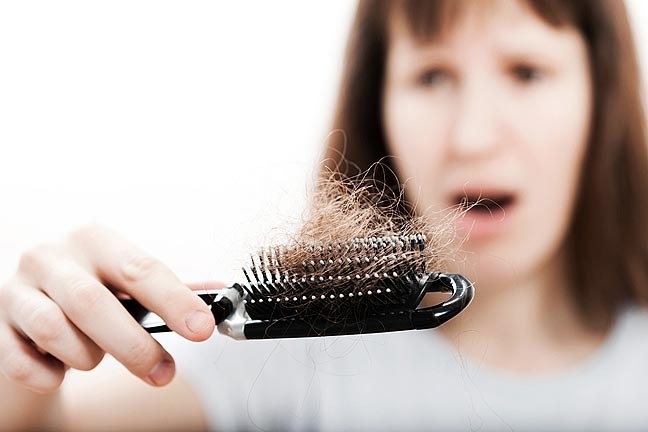 Get rid of stress - Stress can make your hormones run wild, leading to hair loss. When you're stressed, you don't eat right, sleep right and in general, you don't take care of your body. This means less nutrients for your hair and less focus on hair care. If you neglect your hair because of stress, it will lead to very inconvenient circumstances. 5. Change your form of birth control - Hair loss is especially embarrassing for women, but female hair loss is quite common and one of the most popular reasons is birth control. Certain pills may have a negative effect on you and your hormones and one of its most common side effects is thinning of your hair. 6. Hormones Matter - Hormones play a huge part in the vitality of your hair. If you're pregnant, just reached menopause, experiencing irregular menstrual cycles or experiencing anything that affects the hormones, chances are your hair will suffer for it. Now there's nothing you can do if you're pregnant as sometimes it's a normal part of it, but make sure you ask your doctor what's normal and what's not. 7. Change your hair products - Some shampoos and conditioners may contain strong chemicals which do not sit well with sensitive hair. If you experience hair loss, try changing hair products. Try shampoos and conditioners made of natural ingredients. 8. Comb your hair the proper way - Do not brush your hair directly after bathing; instead, use a wide tooth comb. When brushing your hair, make sure to never force it when it encounters tangles. Help untangle your hair using your fingers gently before brushing it again. Don't over brush your hair. 9. Cleanse you hair - Too much residue from hair products can drag down hair, making it dull, brittle and weak. Twice a month, you may want to cleanse your hair of all the muck from shampoos and conditioners. Buy a clarifying shampoo and use it to cleanse your hair. This is also a good ritual to observe before changing shampoos or conditioners. 10. Have a positive outlook on hair loss - When you find your hair suddenly thinning, don't freak out! This is one of the most common mistakes people make. They go out, try whatever product is there on the market and lose sleep over this problem. By stressing over hair loss, you are actually making the problem bigger. It can be prevented using natural means and all you need to do is to think straight and consider all your options.